Automotive companies are investing a lot of interest in intelligent systems which can assist the driving process. Radar and laser sensors based applications are dedicated for precise pose measurements but they cannot give a complete description of the driving environment due to their nature. Vision sensors can compensate the information lack of their measurements. Stereovision has been proved the only method able give reliable results both for measurements and description of the driving environment. 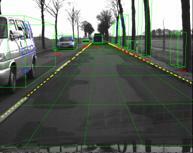 Development of a real-time stereo camera based system able to give a complete description of the driving environment. The system is optimized for highways but works well also on country roads or town scenarios. The acquisition system is composed from two digital b/w cameras mounted on a stereo-rig. The cameras and stereo-rig parameters are calibrated using a dedicated methodology, optimized for far-range stereovision requirements. Stereo reconstruction is performed on edge features. 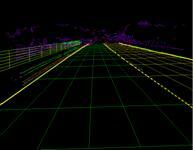 Features belonging to lane delimiters are classified and their 3D coordinates are used in the lane detection process. The 3D points above the detected road surface are grouped into objects, taking into account the vicinity criteria, density variation with the distance, and 2D image information such as similar texture and connecting edges. Tracking using Kalman filtering is used both for lane and objects parameters. • On-line methods based only on the driving environment (fig. 1- down). A stereo reconstruction method for high resolution and far distance stereovision, working in real time, was implemented. Accuracy of the classical stereo reconstruction was improved by sub-pixel contour correlation. An original and robust solution for lane detection using 3D road features, a model driven approach and Kalman filter tracking was developed (fig.2). It uses non-flat road assumption, and works even in extreme conditions (absence of lane markings - fig. 3). 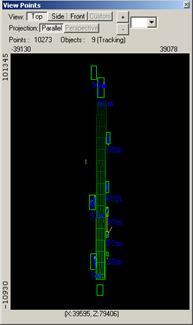 Side lanes and driving area (with delimiters) are also detected (fig. 2). Detected lane parameters are: vertical and horizontal curvature, lane width, and lateral position of the ego-car inside the current lane. 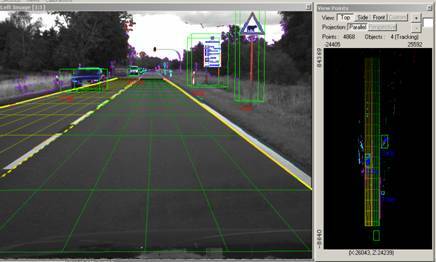 The equation of the road surface is used for obstacle/road point separation and therefore object detection works even on non-flat road scenarios. The over-rode 3D points are grouped into objects taking into account the vicinity criteria. The 3D density variation with the distance is taken into account. 2D image information such as similar texture and connecting edges are refining the grouping process. The object's position is tracked over successive frames using a mathematical motion model and Kalman filtering. Detected objects are described in terms of 3D position, size and speed (fig. 3 and 4). We have developed a system based on stereovision able to perform in real time many tasks needed for driving environment description and measurements. The system functions are integrated into a dedicated stereovision framework, which can be easily extended with other capabilities (e.g. image analyzes tasks) or to build a specific application for an active security or driving assistance system for automotive industry. The obtained expertise of the research team has reached the state-of-the-art level in some specific fields of the computer vision usable in robot or automotive applications: camera calibration, high-resolution stereo reconstruction, stereo measurements, object detection and tracking, 3D lane detection, stereo image acquisition systems (control, programming, design). S. Nedevschi, F. Oniga, R. Danescu, T. Graf, R. Schmidt, "Increased Accuracy Stereo Approach for 3D Lane Detection", Proceedings of IEEE Intelligent Vehicles Symposium, (IV2006), June 13-15, 2006, Tokyo, Japan, pp. 42-49. T. Marita, F. Oniga, S. Nedevschi, T. Graf, R. Schmidt, "Camera Calibration Method for Far Range Stereovision Sensors Used in Vehicles", Proceedings of IEEE Intelligent Vehicles Symposium, (IV2006), June 13-15, 2006, Tokyo, Japan, pp. 356-363. S. Nedevschi, R..Schmidt, T. Graf, R. Danescu, D. Frentiu, T. Marita, F. Oniga, C. Pocol, "3D Lane Detection System Based on Stereovision", IEEE Intelligent Transportation Systems Conference (ITSC), 2004, Washington, USA, pp. 161-166. S. Nedevschi, R. Danescu, D. Frentiu, T. Marita, F. Oniga, C. Pocol, R. Schmidt, T. Graf, "High Accuracy Stereo Vision System for Far Distance Obstacle Detection", IEEE Intelligent Vehicles Symposium, 2004 (IV2004), Parma, Italy, pp. 292-297.